I get a test car, jump in and scan a professional eye over its interior. I make mental notes. Tsk, no satnav. Hmph, the leather is a bit firmer than I was expecting. I'm testing and ultimately reviewing the car for my readers and viewers. I have to assess how it compares to those in its class and, because this is Speedmonkey, those that aren't in it's class. I have, after all, just announced to everyone I was going to buy a Mk5 Golf GTi and then straight away went and ordered a brand new Volvo XC60. I'm no fan of buying a car purely for what it tells the world about me or, heaven forbid, as an investment. It's a crying bloody shame to buy a gorgeous old motor only to stick it in a barn until it's increased in value by 100%. No, what I like about cars is their ability to comfort me, to excite me, to thrill me, to assuage the outside elements whilst causing my adrenalin gland to squirt with glee and enliven my brain. And when a test car arrives and it falls short in some small area I mentally place a VERY LARGE cross in that particular box in my head. The Citroen C4 Cactus - lovely car, comfy seats, bit slow but ultimately fine, however it has no bloody rev counter. This is a travesty. I shall have to place a curse on the engineers in Saint Ouen who decided not to fit such a simple yet essential device. And multiple Mercedes-Benzes have leather trim on their dash tops and seats that isn't actually leather. It's fake! Oh my god the world is going to collapse. More travesty, more curses. How could they do this to us? 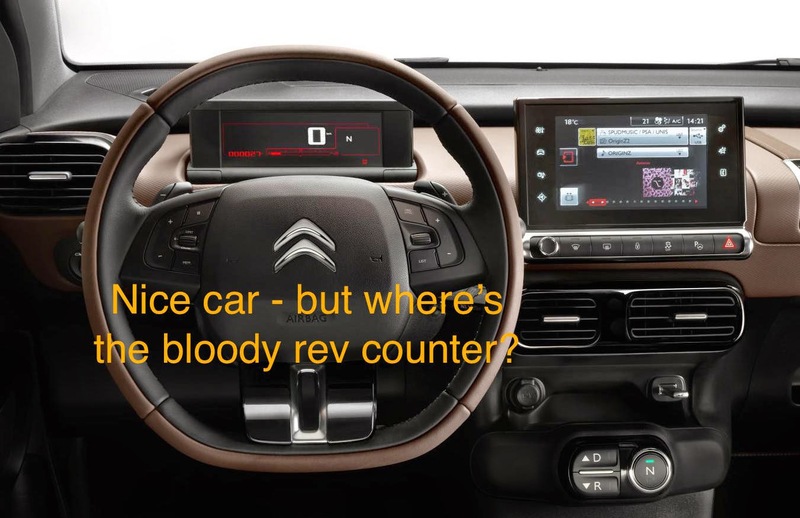 Peugeots and Citroens with satnavs that don't allow full postcode input, the fact you've got to pay £2k even to have satnav in a new VW Golf, no DAB (even as an option) on some Nissans - I put a great big cross in all their boxes. I'm becoming finicky, obsessive about the details. I expect more. I expect every single car on sale, no matter how much it costs, to have heated seats, satnav, adaptive cruise control, electric windows, automatic lights, rain-sensing wipers, adaptive main beam, bluetooth, digital radio and a steering wheel which adjusts for reach as well as rake. I expect all of this because, because... Because I've got used to these features. I like them and they make life easier. I think they are as essential as water, air and the right to a free education and F1 on terrestrial TV. But, on the other hand, maybe I'm not becoming a snob. Most of these things don't cost much, and don't weigh much either. A smartphone weighs just a few grams but can run a satnav. Why should satnav cause an increase in emissions or price. To charge for it is pure greed. Maybe by expecting car manufacturers to include these basics and pointing out when they haven't I'm doing my readers and viewers a service. Maybe I'm not a snob. Maybe I've just realised this is 2015 and certain 'options' should be included gratis when a consumer purchases his or her shiny new motor. Yes, that's it. I'm not a snob - car companies are just being slack. They should and could do better. When you buy your next new car check that it has the essentials, and if it doesn't buy something else.